The awards also paid homage to Redford, 82, granting him an honorary Cesar and the US star used the occasion to share some of his earliest memories of visiting France. Jacques Audiard received the best director award for “The Sisters Brothers” (“Les Freres Sisters”) while Alex Lutz took best actor for his depiction of “Guy”, which he also wrote and directed. The big favourite ahead of the night, “Sink or Swim” (“Le Grand Bain”), a comedy about a group of men throwing themselves into the world of synchronised swimming, had a disappointing evening, winning only a best supporting actor award for Philippe Katerine. 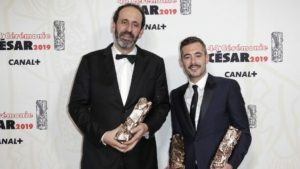 The post ‘Custody’ wins big at French film awards appeared first on SABC News – Breaking news, special reports, world, business, sport coverage of all South African current events. Africa's news leader..